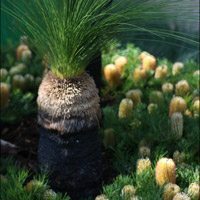 Grass Trees – Xanthorrhoea species for sale retail direct to the public and Grass Tree Nurseries. Grass trees are common in many Australian states and are popular with the home gardener. All grass trees or Xanthorrhoea species are a slow growing plant and are usually very hardy and long lived. With 28 species and also some sub species Xanthorrhea do vary in appearance and growth habit. One thing that they do have in common is that they are a very popular landscaping plant. Slow growing , advanced specimens are not cheap, however even a small Grass Tree can make a great addition to many landscaping projects. All will develop a woody stem or trunk over time, some develop this below the group, others above. Foliage is long and ‘grass like’ however it does differ from species to species. The species most commonly found for sale is Xanthorrhoea australis, long narrow leaves and forming a reasonable sized garden plant in around 5 years from seed. It will take much longer to develop a good above ground trunk. Larger specimens are available for sale, however they may need machinery to be transplanted successfully. Grass Trees require a well drained position and a sunny aspect. The tall woody flower spikes are a spectacular feature. Grass Trees may be grown in pots or planters. Keep your grass tree roots wrapped in damp hession or similar until you are ready to plant it, hopefully within 1-2 days. Dig a hole at least 1m wide or 3 times the circumference of the grass tree to be replanted. Make sure that the hole is deep enough to hold the tree at the correct level. Remember that Grass Trees require a well drained soil, if Grass Trees are left to sit in water they will rot, try filling the hole with water, if it holds water easily you might be advised to install some drainage or plant the tree on a raised mound. So although grass trees like some water when being transplanted, they do not like wet soil…..
Cover the roots with soil and then water in well to remove all air pockets. Half fill the hole and water in well again. If you plan to use an irrigation system or watering system now might be the time to install it. Continue filling the hole to 3/4 full and water in again. Fill the hole completely and water in again. Grass Trees do not like to sit in wet ground, so monitor this, the soil should be free draining.